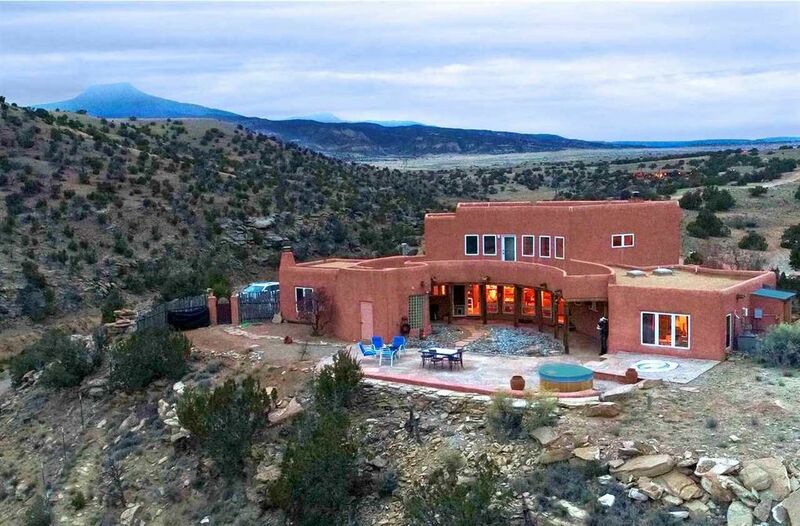 If you are looking for a Custom Luxury Home on an expansive mesa top with 360 degree views of Abiquiu Lake, Ghost Ranch and Cerro Pedernal, this is a must see. The famous Abiquiu landscapes, beloved by Georgia O’Keefe and many famous artists, are yours to enjoy daily. The changing light from sunrise to sunset offers incredible colors, a feast for your eyes. Famed architect, Paula Baker, designed this stunning spiral shaped adobe home based on sacred geometry and the golden section. A home like no other, the arched doorways, welcome family and friends throughout the house. The soaring two-story kiva fireplace is the focal point of the great room, which includes the gourmet kitchen with chiseled and polished flagstone countertops, the dining area, and the living room. Large windows throughout the great room provide light and heavenly views of Abiquiu Lake, the mesas, mountains, valleys and sky. The master bedroom is a masterful piece of art, beginning with the domed ceiling, fireplace and incredible pillars. The center of the spiral is located in the curved glass block shower, a whirlpool tub a waits. This 2863 square ft. home on 5 acres features sensuous interior design with gorgeous details, sculptural touches, hand crafted doors and woodwork. The upstairs loft can be used as a third bedroom or as an art studio with inspiring views. The adobe keeps the home warm in the winter and cool in the summer. This house has so much to offer, one has to literally see it to believe it. Directions: From Abiquiu Post Office go west on Hwy 84, turn on Hwy 96, go 6.8 miles to Laguna Jacquez Subdivision Gate. Go through gate, and travel approximately 1.4 miles on main road, Home is on the left.